American expat Aubrey has only two weeks left in Europe before she leaves for college, and she's nowhere near ready. Good thing she and her best friend, Rae, have planned one last group trip across the continent. From Paris to Prague, they're going to explore famous museums, sip champagne in fancy restaurants, and eat as many croissants as possible with their friends Clara, Jonah, and Gabe. But when old secrets come to light, Aubrey and Rae's trip goes from a carefree adventure to a complete disaster. For starters, there's Aubrey and Gabe's unresolved history, complicated by the fact that Aubrey is dating Jonah, Gabe's best friend. And then there's Rae's hopeless crush on the effortlessly cool Clara. How is Rae supposed to admit her feelings to someone so perfect when they're moving to different sides of the world in just a few weeks? 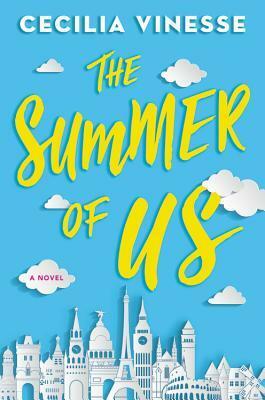 Author Cecilia Vinesse delivers a romantic European adventure that embraces the magic of warm summer nights, the thrill of first kisses, and the bittersweet ache of learning to say goodbye to the past while embracing the future.